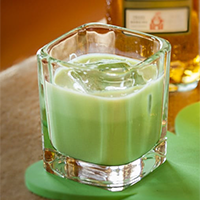 1/2 oz Creme de Menthe. Jigger, Shaker Classic/Boston, Strainer, Rocks Glass. Shake with ice all the Ingredients. Strain into a Rocks Glass (Old-Fashioned) with ice.